My copy of the new novel Bounded Rationality, by Pamela McCorduck has arrived! The book features the Santa Fe Institute, which I’m very curious about now. Why don’t I know more about them? Speaking of the “information they have”, I just read an essay titled, No, You’re Not Entitled to Your Opinion, where he says, among other things, that the attitude that you are entitled to your opinion, regardless of the facts or your ability to defend your opinion, “feeds, I suggest, into the false equivalence between experts and non-experts that is an increasingly pernicious feature of our public discourse.” I couldn’t freaking agree more. Here is an interview with McCorduck about her new novel. Oh wait, this is the second in a trilogy. I need to go back and read the first one first. 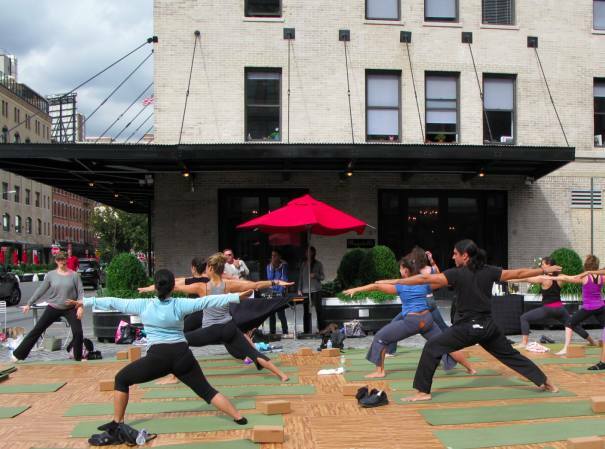 A week or so ago I passed by this outdoor yoga class in the Meat Market. There always seems to be something going on in this spot. One of the more disturbing aspects of academia I saw throughout grad school was that many professors who were generally very smart people thought that because they were experts in the one thing they specialized in, that also made them qualified to pontificate on areas that were outside their realm of experience. That academia doesn’t exactly moderate most professors’ egos didn’t help – there was rarely anyone in a position to tell them when they were making fools of themselves, at least to their faces. That’s one reason I’m automatically disinclined to vote for academics who try their hand at politics. Depth in one area without breadth of experience is exactly the opposite of what politicians need, which is the capacity to deal with a wide variety of issues. There’s also the problem that intellect doesn’t equal wisdom. I completely agree with tagryn. And in addition, the professors tagryn refers to spend most of their day being assessed by 18-year old to early 20s college students without the slightest real-world experience. I imagine we could all look pretty good to a bunch of college kids if we were in a position of authority, and in an asymmetrical power relationship. I have known people with PhDs who couldn’t balance a check book, who couldn’t figure out how to calculate a tip after dinner. A friend works in a good Texas college called TCU. The alumni had to come in and figuratively pound on the college president because the liberal arts college was turning their kids into far leftists who wanted to injure financial institutions and corporate institutions. The parents who were alumni were furious beyond words, because they thought they were paying serious prices so that their kids could graduate, get hooked up with remunerative possibilities, and make a life for themselves. The president of the college had to sit on the liberal arts departments. Then another problem arose, because the college had a certain allocation of funds, and the business department quickly figured out how to scarf up the funds while the English, psychology, and sociology profs were all in never-ending, painful debates about various moral and ethical considerations relative to dividing up the money… and this only ended in accusations hurled about. Too many academics think that reality is what has been formed in their minds through their reading, and this constantly clashes with the real, serious requirements of real life. Yeah, this has never been my experience. I’ve never met a professor who couldn’t balance a checkbook or calculate a tip. And all of them live in the same real world as I do. Everyone’s experience is filtered by a variety of factors. One could argue that people in the financial arena similarly live in a fantasy world, but everyone is mostly seeing their piece of the real-world pie only. Some individuals see beyond, but most don’t. Apparently. I wasn’t speaking about intellect, but about being informed, with both facts and experience. If you have an opinion that you cannot defend with both, then in most cases I think you’re holding on to something you want to be true. The more educated and informed the better. Also, I have to add, that classroom work is only part of an academic’s job. They are expected to research, to add to our pool of knowledge, and many of their lives are much more real than, well, say mine.